I love hiking on trails around the island. 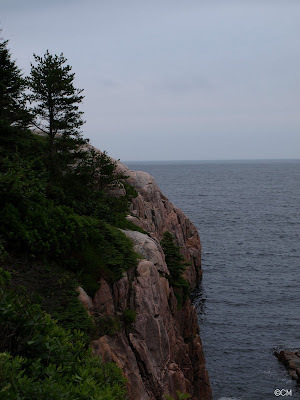 Last week, we took a drive up to the Cape Breton Highlands National Park. 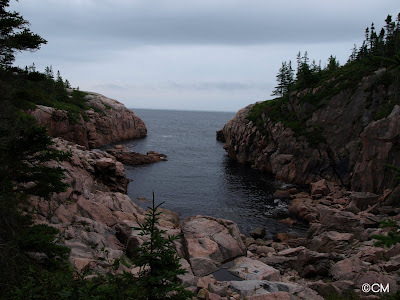 We drove around for a bit then decided to walk the Jack Pine Loop next to Black Brook Beach. The sky was gray and the wind was up. Most of the trail was exposed granite where only Reindeer Moss and lichens grew. It was so quiet I thought we'd see a bear or moose for sure but we didn't. Glad we didn't! Here are some favorite shots. That is just beautiful. It looks so peaceful. One of these visits I would like to have time to do stuff like that. I am always in such a hurry when I am up that way! Kelly- I find hiking up there so peaceful and calming. What views... I wish I had places like these near me for some walks/hikes. Lucky you! Nice photos! I love the Highlands and have hiked a quite a few of the routes. Never seen any bears (don't know that I'd like to) but have run across some moose, including a mother with her little one - I was sooo nervous that we would upset the mama but they calmly meandered away. Wow. Any chance you can put some on your craft site so we can buy some? I love nature scenes like that. Beautiful pictures, Chris. What a gorgeous place to go hiking. I am jealous.